Purposeful good looks and a luxurious interior make the 2016 GMC Acadia crossover SUV the perfect ride for the upwardly mobile family. The 2016 gmc acadia electric vehicle qualifies for a federal tax credit of up to $7,500, effectively reducing the net base price. While it shares the same platform as the Buick Enclave and Chevrolet Traverse, the 2016 GMC Acadia 8-passenger SUV in either front- or all-wheel-drive form (FWD, AWD) presents a more rugged exterior juxtaposed with a luxurious interior. In Denali trim, it approaches near-Cadillac levels of equipment and refinement. Passenger space is the Acadia’s trump card, with ample room for adults in all three rows. And, unlike the Hyundai Santa Fe, Honda Pilot or Toyota Highlander, the Acadia provides ample cargo space with its 3rd-row seat up. With 7.6 inches of ground clearance and maximum tow rating of 5,200 pounds, the Acadia bests both the Ford Flex and Mazda CX-9. Add the available AWD, and the Acadia can tackle just about any road condition. If you’re looking for a reasonably sized crossover SUV that can still fit up to eight adults plus all of their gear, the 2016 GMC Acadia has you covered. Decent fuel economy, good safety ratings and a luxurious interior make the choice all the easier. If you need the big towing and off-road ability of a body-on-frame full-size SUV, then a GMC Yukon or Ford Expedition is a better choice. Those looking for better fuel economy might check the Toyota Highlander Hybrid or Audi Q7 TDI. For 2016, all GMC Acadia models feature OnStar 4G LTE connectivity that includes a standard built-in Wi-Fi hotspot. If you prefer the driving feel of a car to a truck, you’ll feel completely at ease behind the wheel of the 2016 GMC Acadia crossover SUV. The Acadia’s suspension is firm enough to allow it excellent stability in turns, yet compliant enough to deliver a smooth, comfortable ride. Feedback from the steering is about what we’d expect from this class, heavily weighted and accurate, but not sports-car-like reactive. GMC’s engineers have done an excellent job isolating the Acadia’s cabin from wind and road noise as well as creating some of the most comfortable seats we’ve experienced, including the 3rd -row seat. Although the Acadia’s standard 3.6-liter V6 is one of the most powerful engines in this segment, it can feel a bit strained with more than six passengers on board. To be fair, the same is true for a fully loaded Honda Pilot, Toyota Highlander or Hyundai Santa Fe. For many SUVs, the 3rd-row seat seems little more than a place for very young children or a pet. But not in the 2016 GMC Acadia where 3rd-row passengers enjoy comfortable seats, good legroom and easy access via the one-touch slide-and-fold 2nd-row seats. The Acadia’s 3.6-liter V6 is smooth, efficient and powerful. Like other 6-cylinder rivals, about the only time the engine feels taxed is when towing or hauling the maximum load limits. With seating for up to eight people, including a 3rd-row seat that can accommodate adults, the 2016 GMC Acadia crossover SUV is about as people-friendly as a standard-size vehicle can get. A clever sliding 2nd-row seat permits easy access to the third row, as do the long rear-door openings. An unexpected benefit is the Acadia’s surprisingly spacious cargo area. Even with the 3rd-row seat in place it really will hold eight people and a good percentage of their gear. Fold both rows flat, and the Acadia offers up a whopping 116.9 cubic feet of cargo-hauling capacity. We like the conservative yet rugged and purposeful styling of the 2016 GMC Acadia SUV. You won’t find any tacked-on body cladding or garish add-ons. Even the Acadia Denali, with its big chrome mesh grille and larger-diameter wheels, resists the temptation to go overboard. Riding on standard 18-inch wheels, the Acadia has a purposeful, wide stance, while chrome and LED lighting add noticeable yet tasteful elegance. A subtle rear spoiler helps reduce aerodynamic drag and looks sharp, while the chrome exhaust tips and roof-rail accents help the Acadia shine. The GMC Acadia SUV for 2016 is a well-equipped vehicle that includes GM’s OnStar system with one year of complimentary service, color touch-screen stereo with six speakers and MP3 capability, satellite radio, 7-passenger seating, dual exhaust with chrome tips, rear spoiler, sliding 2nd-row seats, fog lights, rearview camera, rear park assist and 18-inch wheels. Government-required safety features include StabiliTrak electronic stability control with rollover mitigation, anti-lock brakes (ABS), Tire Pressure Monitoring System (TPMS) and seven airbags. The Denali trim adds a heated steering wheel, heated and cooled front seats, dual SkyScape sunroof, perforated leather seating surfaces, 20-inch wheels and more. 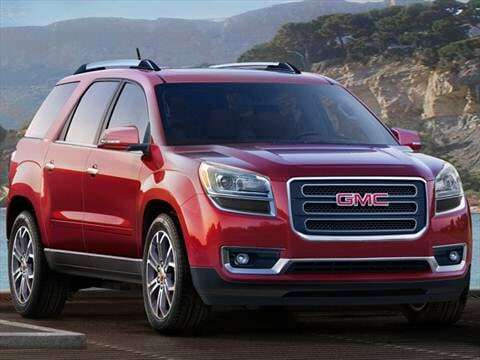 GMC offers a variety of convenience and luxury features for the 2016 Acadia. Dual sunroofs and a rear-entertainment system make the drive more enjoyable. The interior can be outfitted with a color touch-screen navigation system (standard on Denali), IntelliLink Bluetooth streaming of apps, tri-zone automatic air conditioning, heated and cooled front seats, premium audio with surround sound, a head-up display, cargo-area audio controls and 8-passenger seating. Exterior options include a power liftgate, High Intensity Discharge (HID) headlights and 20-inch wheels. Forward Collision Alert and Lane Departure Warning are standard on the Denali and optional on SLT1 and SLT2 trim levels. The 2016 GMC Acadia SUV’s capable 3.6-liter V6 has variable valve timing and direct fuel injection, both of which contribute to enhanced responsiveness and an appreciated output of 281 horsepower (288 in the Denali). The maximum rating of 5,200 pounds will allow the Acadia to deal with modest-sized trailers. The 6-speed automatic transmission maximizes engine performance and helps the Acadia achieve excellent fuel economy for a vehicle of its size. However, at times the transmission can be slow to react to quick throttle inputs, resulting in delayed downshifts when trying to accelerate to pass other vehicles. On balance, we think it’s an entirely commendable and pleasurable drivetrain. The Manufacturer’s Suggested Retail Price (MSRP) for the 2016 GMC Acadia SUV starts at around $32,000 for the FWD SL. That’s more than the entry prices of the Ford Flex, Toyota Highlander or Honda Pilot, although the price gap narrows when comparing similarly equipped models. The better-equipped SLE1 starts closer to $35,000, while a loaded GMC Acadia Denali with AWD can reach close to $55,000. While priced at the high end of the segment, the Acadia’s generous standard equipment list must be taken into consideration. To compare the actual transaction prices that consumers are paying in your area, be sure to check the KBB.com Fair Purchase Price. Though higher priced than its competitors, the Acadia is expected to have excellent resale value, remaining slightly above the Ford Flex but not as high as the Honda Pilot and Toyota Highlander.